The following lesson starters and activities might be useful in supporting the three key areas assessed for the Welsh Bacc Community Challenge, and may inform other classroom activities. 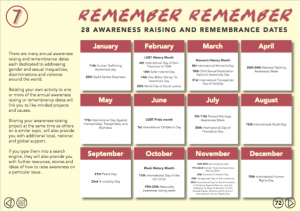 Go to p.72 and print/digitally share the Remember Remember page. 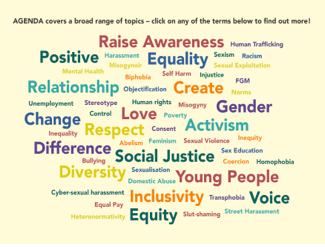 This page provides 28 international awareness raising days on a wide range of issues, from International Human Rights Day to International Women’s Day. Task: invite students to select 3 of the days, and then find as many NGOs as they can that support these days. They can be big or small – local, national or global (e.g. WEN Wales support International Women’s Day). Extension task: invite students to find out which organisations or individuals started one or more of these days, and when they began. 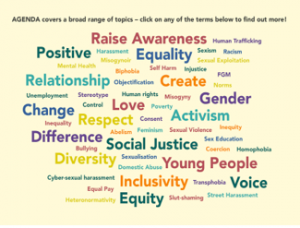 Ask students to pick one issue from the “word cloud” (p.6), or from the Awareness Raising/Remembrance days (p.73), and find three organisations which provide further information about this particular issue. Extension task (1) : invite students to find out which government policies or laws apply to their chosen issue (e.g. Wales and Beyond). Extension task (2): invite students to source research evidence on their issue, using the organisations they have identified (e.g. numbers of people affected; who is more at risk; change over time etc.). 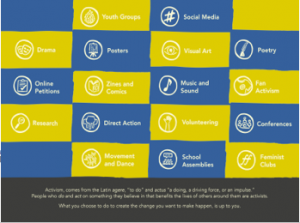 AGENDA is full of creative and innovative activities to support students in raising awareness of an issue that matters to them with others (e.g. peers to community members). 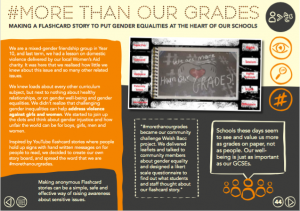 TASK: Section 4 (page 21) outlines 17 different ways in which young people in Wales and beyond have taken action on issues that have mattered to them in the most creative ways. a) Individually or in groups invite students two choose two contrasting modes of change (e.g. online petition V poetry, or school assembly V social media). 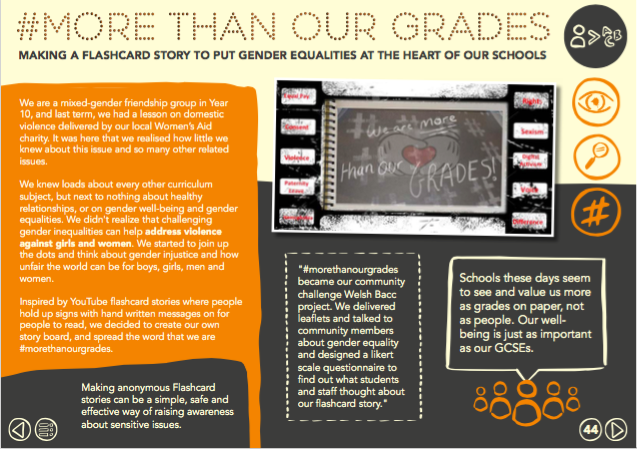 There are postcards for each mode of change that can be downloaded from the www.agenda.wales website. Print a copy for each student and they can write the strengths and weaknesses they have identified on the back. Extension Activity 1: In groups or individually, select one mode of change and research this in more depth. On each page, there are links to begin this process (e.g. “Zines and comics” on p.23 provide links to the British Library’s collection of zines and graphic books and comics and on p.22, for “visual arts” there are links to websites showcasing activist art from around the world). Extension activity 2: Print out the DIY activities which can be downloaded individually from the www.agenda.page. In groups or individually, ask students to select one and follow the instructions (or adapt). They can get started right away, or read the case study where a similar activity has been used (e.g. the ‘relationship-web’ activity originated from the “Reclaiming Positive Relationships’ case study). Be sure to check you have the materials needed. Each DIY postcard outlines exactly which materials are needed. Which issue did they explore to raise awareness of? How did they share their message (e.g in school, community)? How did they evaluate what they did? a) How do you want to make a difference? c) Do you have a target audience? d) Who can help you? e) What’s your next move? 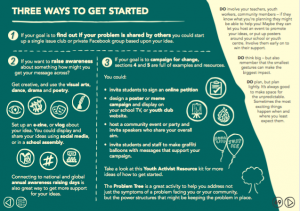 For students that need a bit of extra support, “three ways to get started” provides a more structured beginning, including links to the “Problem Tree” – an activity which helps students address not just the symptoms of a problem, but the power structures and inequalities that might be keeping a problem in place. Each brief includes dedicated resources for teachers and students to support design and delivery of the brief.